The doctor who was wounded during a shootout inside Mercy Fitzgerald Hospital last week is sharing photos of his recovery. DARBY, Pa. (WPVI) -- The doctor who was wounded during a shootout inside Mercy Fitzgerald Hospital last week is sharing photos of his recovery. On his Facebook page, Dr. Lee Silverman post a photo of himself with bandages on his head and hand. Meanwhile, another photo shows his daughter holding a picture she drew of her father, showing him with his bandages. Silverman was wounded and a caseworker, 53-year-old Theresa Hunt of Philadelphia, was killed during that shooting. Action News has learned that the suspected gunman, Richard Plotts, was arraigned late Saturday night. Silverman, who was legally carrying a gun, returned fire after Plotts shot and killed Hunt, the Delaware County DA says, and was credited by the DA with saving more lives. District Attorney Jack Whelan said Plotts had 39 bullets on him - bullets intended for more victims. Action News has learned Plotts, still hospitalized under police guard, was arraigned bedside on murder, attempted murder, and related charges on Saturday night. No bail was set. Whelan says two guns and a computer were seized from Plotts' home in Clifton Heights this weekend. Investigators say Plotts opened fire inside the wellness center of Mercy Fitzgerald Hospital on Landowne Avenue in Darby Borough just after 2:00 p.m. Thursday. Whelan said Plotts was agitated and refused to sit down next to Hunt, his social worker. Plotts pulled a gun from his waistband, Whelan said, and shot Hunt point-blank in the head, killing her instantly. Dr. Silverman crouched behind a chair, pulled a gun from his pocket, and fired six shots. He hit Plotts twice in the chest and once in the arm. Another doctor and another caseworker, who heard the shots, came running to help. "After he heard the shots fired, this caseworker then went back into the room and engaged in a wrestling match with Mr. Plotts," Whelan said. Photos of the crime scene, obtained exclusively by Action News, show a window shattered by the bullets. There are also pictures of the blood-splattered office, including bloody hand prints on the carpet left by Plotts as he tried to crawl away before he was subdued. Plotts had a long history of mental health issues and arrests for a bank robbery, gun charges and drugs. Investigators don't know where he got the gun he used on Thursday. Action News spoke with Plotts' ex-wife on Thursday night. "He was always very controlling and very violent. He was physically abusive, mentally abusive, and I just never thought, the many times he was in and out of jail, he had changed from any of that. I'm not surprised," she said. Dr. Silverman's gun was legally registered and he had a permit to carry. "I believe if the doctor did not have the firearm, if the doctor did not utilize the firearm, he'd be dead today and I believe other people in that facility would be dead," Whelan said. Plotts had been seeing Dr. Silverman off-and-on for the past 20 years and there were no specific threats before Thursday's outburst. In a statement issued Friday, Mercy Fitzgerald Hospital said: "We are thankful for the swift action of Dr. Lee Silverman, Dr. Jeffrey Dekret, John D'Alonzo and the other colleagues and visitors who took brave and difficult action during yesterday's tragic event. We extend our condolences to Theresa Hunt's family, and we are praying for Dr. Silverman's speedy recovery. We look forward to Dr. Silverman's return to serving patients at our hospital. We will do all we can to support the victims during this difficult time." 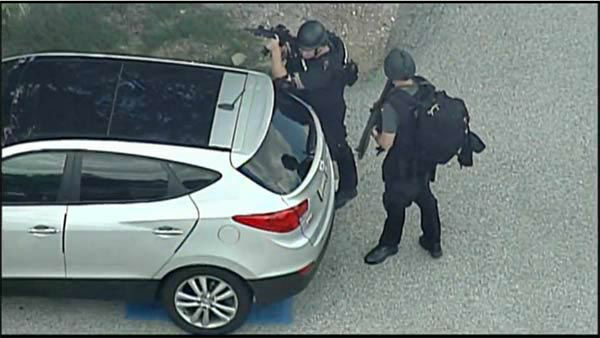 Chopper 6 and the Action Cam were on the scene of a shooting on the campus of Mercy Fitzgerald Hospital.